Both Austin and New Braunfels were in my intinerary for the music, but San Marcos is conveniently located in the middle so a visit was 'unavoidable'. The wing, which has been in existence for about a quarter of a century, was the 7th chartered by the CAF. 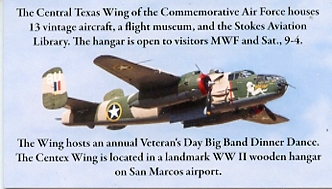 warbirds owned by members. This building was constructed in 1943, the only surviving building here of that era. Canadian Car & Foundry Harvard 4 N7754, dressed up as a Japanese 'Zero'; ex/ CF-WPN. in the hangar the previous weekend, so had taken most aircraft outside. This certainly facilitated my photography! N375VU is a Beech TC-45J (c/n 5569, ex/ SNB-2 BuNo.51242), reg'd to Mark L. Frederick of Taylor,TX 30Nov2004. The type is also referred to as 'SNB-5 Navigator'. See further below for type & history details. "N375VU belongs to me, I have it on lease-back to the CAF Sqdn in San Marcos. Yes, they have done some wonderful things to it. I had to keep it outside for the 10 years I had it, and since they wanted it polished, they had their work cut out for them! They have done a good job bringing her up to excellent condition. Once she is all re-assembled, I will go there & start training their crews to operate the ship as a rides program ship. I think the training is gonna be fun, and those fellas will also have a great time flying her." SNB-5 ca.1954. Redesignated UC-45J in 1962. Sold to Vincennes University reg'd N375VU during the 1970's. Sold to Academy AL during the early 80's. Stored Griffin(GA). Imagine, manufactured in 1943 and in such a shiny state! It does miss a few critical parts, though! The hangar dates from 1943. N3646G is a North American AT-6 Texan (c/n AJ-688), registered to American Airpower Heritage Flying Museum. The date of registration was a surprise: as recent as 23Oct2015! On the aircraft one can read the tailnumber N547W; in small lettering: SNJ-3, s/n 05437, Bu. 78-7266. 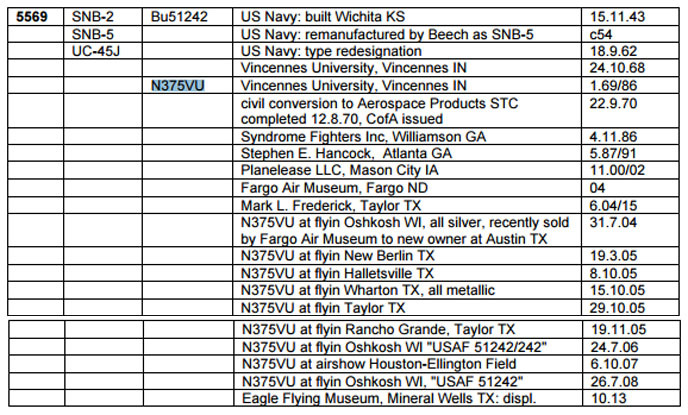 On FAA's N-inquiry website I found N547W reg'd to Michael L. Collier of Lakeway,TX on 09Nov2010. Lockheed T-33A N155SF (ex/ 56-1749, N61649). Robert L. Weeks of Liberty Hill,TX is the owner. Nicknamed 'the Shooting Star', owning and flying it must be an expensive hobby! Lockheed T-33A 'Cow Pony 44' has been polished to a shiny gloss. This Stinson L-5 Sentinel (c/n 3551) is reg'd N4252K, to Jerry E. Patterson of Austin,TX (12Aug2010). The Stinson L-5 Sentinel was a WWII era liaison aircraft used by all branches of the U.S. military and by the British Royal Air Force. Along with the Stinson L-1 Vigilant, the L-5 was the only other American liaison aircraft of WWII that was purpose-built for military use and had no civilian counterpart. All other military liaison airplanes adopted during World War II were lightly modified 'off-the-shelf' civilian models. N5435A ('58310" is a Cessna 310B (c/n 35635). It has been painted in the colours of one of the U-3 Blue Canoe aircraft operated by the U.S. Air Force. It is reg'd to the American Airpower Heritage Flying Museum. N9272C '93555' is a North American AT-6C Harvard (also referred to as 'Texan'). 41-33583, EX610, 7303 South Africa. AT-6C '93555' was reg'd N9272C on 23Sep2000 for Warbird Flyers LLC (Austin,TX). Add an engine and it'll be fine! renovations and improvements continue on the hangar as well and that hangardoor will be taken care of too some day. on FAA's N-inquiry page; it also mentions a secondary type identification: SNJ-4. Manufactured in 1942. N7678Z was reg'd to Thomas M. Lang (Lakeway,TX) on 09Oct2012. I hope those South African Air Force markings will be retained! A solid bunch of Harvards here! Another North American AT-6C, N211RF was reg'd on 17Apr06 to Richard F.
at local air shows, local events, and veterans ceremonies, much as we do in the CAF. elsewhere under 'CAF Yellow Rose squadron' in Bob Ogden's book; but also here at San Marcos!"). Flying Museum since 10Sep1991. Bob Ogden has its previous identities as: 43-27868, N9077Z. Yellow Rose Squadron in order to bring the Rose back into full operational readiness. education exhibit dedicated to those who gave their all for world freedom during WWII. I could find no details of this 'Blue Angels' A-4(?). DC-9-32F (manufactured in 1967!) N904CE is a long way from its home in Alaska! What could it be doing here?! N904CE is weighed down by a trailer, which has a groundpower loaded on top of it. that Everts is operating Boeing 727 N794AJ in Florida for Zero Gravity Corp., normally based at Ft.Lauderdale. C/n 47040/172 (mfr 1967) flew with National AL (N931F), Evergreen Int'l AL (N931F), ABX Air (N904AX), then to Everts'. Could Tejas AeroServices be performing some sort of scheduled maintenance on Everts' DC-9-32F N904CE? Their hangar seems too small to fit it in, so work would have to be done in the open air. items including documents, uniforms, components, photographs and models. Glad those cameras went down in size a bit! the most comprehensive. I was told that a survivor (until recently two) lives nearby and manages a regular visit. the only one with such an armour plate protection though!). About this WWII raid on Tokyo can be read on Wikipedia. the comprehensive library too. Many books, log books & other archive materials are on hand to study or to browse. What a nice sense of detail: even the men's are decorated with aviation art; I did not dare to check the women's though!